- Reuben tells Helen that he likes her. - Cheryl's feet are hurting. - Phil tells Helen that it's time he started enjoying life again. - Mal awkwardly tells Danni that he's a virgin. Danni is very surprised at Malcolm's revelation. DANNI: Mal, look, no, it doesn't matter! In fact, you know, it's kinda nice! MAL: I'm not totally inexperienced you know...I just haven't got that far yet. DANNI: There's a first time for everyone. MAL: You don't care, really? DANNI: No, of course I don't! I don't know why you didn't tell me before we started going out. I wouldn't have come on so strong! DANNI: It wouldn't have made any difference, really. MAL: I guess I was just too embarrassed to tell you. DANNI: Well, that's really dumb, you know. Look, we'll just take it easy for a while OK? We'll just cruise along, no pressure eh? They kiss. Here endeth today's lesson kids. Lou thanks Cheryl for one of the best birthdays he's ever had. Lou enjoyed the games with the Kennedys. Cheryl is irritable because her feet are hurting so much. There's a message on the answerphone from Connie Matthews. She says that Lou's exit polls are looking really good and he will be Mayor soon! Lou warns Cheryl that 24 hours is a long time in politics, and they mustn't get ahead of themselves. Helen is dressed up to go out with Reuben. Cody and Hannah ask when he's coming over for dinner(!) Helen isn't ready for that yet, but she tells them they had a lovely afternoon drinking tea and going to a Planetarium. They're going out to dinner tonight. Karl comes in to find Danni and Mal kissing on the sofa. Karl is not pleased that they sneaked out of the picnic. Karl looks at them VERY suspiciously and Mal awkwardly tells him that they "didn't do anything". Danni decides to make a sharp exit. KARL: Malcolm...it's all to do with respect. KARL: And responsibility. I'm talking about an approach to women in general. KARL: But you've got to learn it's not just about what you want. You've got to consider the girl's wishes and her feelings. And her reputation. KARL: Do you? And what about contraception, what about avoiding sexually transmitted diseases? MAL: I know about all that stuff, Dad! KARL: I hope you do. Look, please understand, I'm not trying to deny your sexuality. I'd just like you to...to not leap in without fully considering your responsibilities and your obligations. KARL: Oh, come on, there's no need to be flippant. MAL:(indignant) I'm not, honest, there's absolutely nothing for you to worry about! Nothing at all! Phil tells Cody excitedly that Helen didn't come home from her dinner date last night. They giggle. They chat about Stonefish - Cody put him off last night by telling him she was still with Rick. CODY: Maybe you should go out with Stonefish! Cody heads off and Hannah comes in. She tells Phil that she's still going to do rhythmic gymnastics, but just for fun. Danni is moaning about having to do a sports day when she could be studying. Cheryl's feet are still hurting. Lou is apprehensive about the vote for Mayor. LOU: Have you made an appointment with Karl, yet? Because you feet are among my most important constituents! Cheryl has come to see Karl. She limps in to his office and he criticises her shoes. He tells her to go to a podiatrist to get her corns sorted, and some orthapedic shoes. Cheryl would rather suffer for fashion! Stonie is making lewd comments about Mal and Danni. When he's gone, Mal insists to Danni that he didn't say anything - Stonie just assumed they were sleeping together. Mal says Stonefish has a dirty mind. They talk about Mal being a virgin again, and Danni says that three quarters of the guys in the year are probably still virgins! Mal looks quite heartened by this! Helen and Phil are having a coffee. Helen says she had a little too much to drink to risk driving home. He doesn't push the point and tells her that Hannah is going to do rhythmic gymnastics for fun. Phil is worried that Hannah is growing up and he'll lose her too soon. Helen says he's surrounded by people who love him and he'll meet a new partner in time. There is no more information on exit polls. Lou says maybe he's worried about actually *being* the Mayor rather than not being! Cody and Karl are chatting about Cheryl's feet, and how patients don't always take medical advice. Stonie sees Cody going into the Coffee Shop. Phil has brought Karl some magazines for the waiting room. Karl says he would like to start ordering each day's newspapers as well. Hannah asks Helen what the best age to start having a boyfriend is. Hannah asks if Reuben is her boyfriend now and she says he is. Hannah asks if Helen is scared that the family won't like Reuben, just as they didn't like Len Mangel. Cheryl has got her fashionable shoes on again. She takes them off and puts her feet in a bowl of warm water. 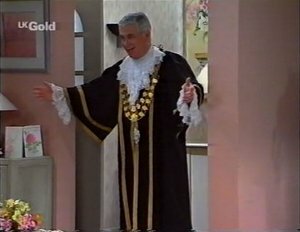 Just then, Lou comes in, dressed in Mayoral robes. LOU: Oh hear ye, hear ye...! ...Any chance of a Mayoral beer? It seems he has been elected and Cheryl is delighted. LOU: One of the more intelligent Council decisions of the decade, wouldn't you say? Cody, Helen and Hannah are preparing dinner. Phil is out playing badminton again. Cody and Hannah giggle about this, saying the badminton teacher has a reputation! HELEN: Why is it that when a woman is friendly towards men, everyone knows about it? Everyone laughs about her reputation behind her back. Don't you think it's unfair, when men admire their prowess and praise for being studs? HELEN: I've had several men in my life, does that make me a woman of loose morals? She runs away to the kitchen table, laughing. HELEN: What I'm trying to say is that a person's personal life, is personal. Phil comes in and says he's had another disastrous badminton lesson. He says he's had some success though - he's been invited out on a date tonight with his coach, Cecily. There is a bit of a pause. HANNAH: Oh, Dad, you'd better eat your greens! She passes him some salad!